Greg’s primary goal in life is to rest in Love. He finds that the practice of yoga provides space for Love to dwell within himself. It is a call of constant renewal that he enjoys sharing with others. Greg was first introduced to yoga in 2004 in Sydney, Australia when a down-and-out friend exchanged lessons for room and board. Shortly thereafter he began to practice extensively with Simon Borg-Olivier and Bianca Machliss of Yoga Synergy in Sydney (https://yogasynergy.com/). In 2007 he completed his yoga teacher training with Swami Govindananda from the Sivananda Yoga Vedanta Meenakshi Ashram, Madurai, India, and in 2009 he returned to that place to complete an Advanced Teacher Training Course. Greg began to practice Ashtanga Yoga in 2010 with Tim Miller in Carlsbad, California (http://ashtangayogacenter.com/), and in 2012 Greg completed Tim’s first series teacher training. In late 2015 and early 2016 Greg completed certificates in “Yoga for Seniors” with Jean Short and “Childplay Yoga” with Gurudass Kaur Khalsa. More recently, Greg trained with Drs Richard Brown and Patricia Gerbarg at the Kripalu Center for Yoga & Health to become certified to teach their Breath~Body~Mind techniques, which are used to alleviate symptoms of stress, insomnia, anxiety disorders, post-traumatic stress disorder, depression, and stress-related medical conditions. In early 2017, Greg completed a Hatha Yoga Intensive with Swami Govindananda (http://www.sivanandapeetham.org/) and Robert Moses (http://namarupa.org/) of the Sivananda Yoga Vidya Peetham in Amboli, India. Greg is currently studying Yoga & Ayurveda with Dr David Frawley at the American Institute of Vedic Studies. Feel free to contact Greg at any time at 506-940-0965. 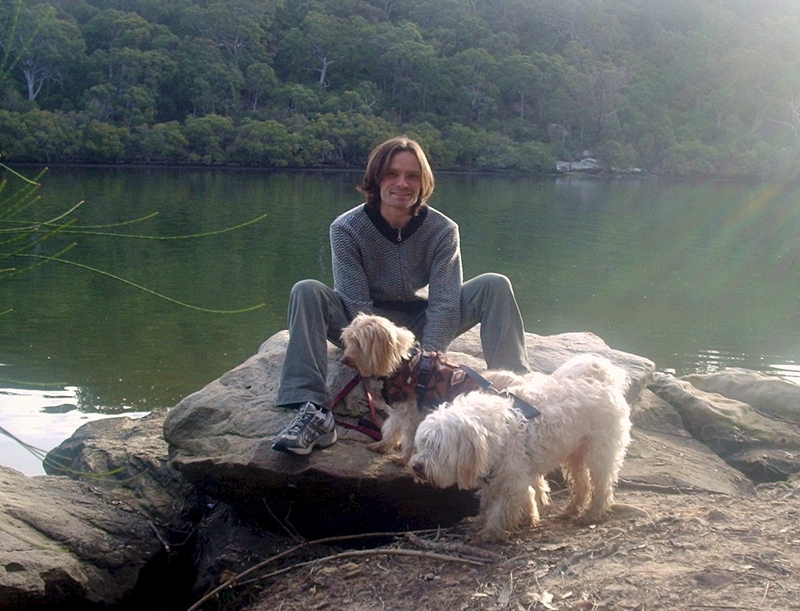 Greg with canine friends Zuga and Mowgli.